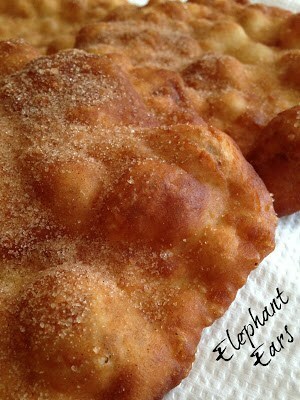 Who doesn’t like Elephant Ears. Those crispy, crunchy, sweet, cinnamony, deep-fried fritters. Those quintessential fair food, classic treats. Deep-fried Deliciousness. 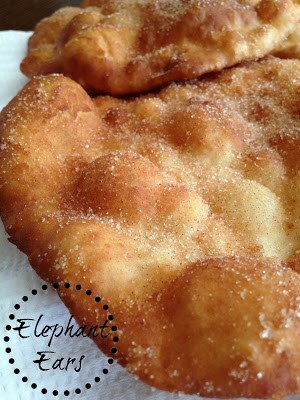 Fried flattened dough, with sugar, cinnamon or powdered sugar, that’s the elephant ear in a nutshell. A thin, disc of fried sweetness that seems to be about as big as an actual elephant eat, but it’s much tastier. This irregularly shaped staple of summer fairs and carnivals, weighs in at a whopping 300 to 500 calories, is a favorite at carnivals across the Midwest. If you get a craving for elephant ears and there doesn’t seem to be a carnival in sight or if it’s the dead of winter and you have a longing for warmer, summertime weather, making elephant ears at home is really not difficult at all. 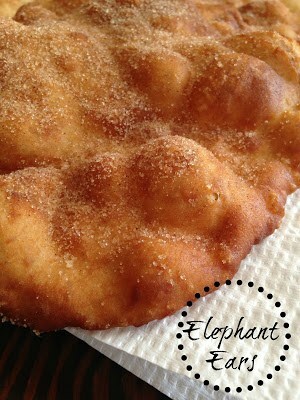 Check out our recipe for elephant ears so you can make up a batch of ‘ears’ at home. Have plenty of cinnamon-sugar on hand or change things up some and top them with macerated berries. In a small saucepan over medium heat, combine milk, salt, 2 tablespoons sugar and shortening. Heat until shortening melts and sugar dissolves. Remove from heat and let cool to lukewarm, 110 degrees F. Sprinkle in yeast and let sit until foamy. Transfer mixture to a large bowl. Stir in flour to make a dough, knead until smooth, cover and let rise 30 minutes. In a large, heavy skillet or deep fryer, heat 1 inch of oil to 375 degrees F.
Roll dough into 1 to 2 inch balls. Shape or roll dough into thin, round discs. Fry discs, 1 to 2 minutes on each side, until puffed and golden. Drain on paper towels. Combine cinnamon and remaining sugar. Sprinkle over warm pastries. Serve.